As seen outside Disney's Pirates of the Caribbean ride. 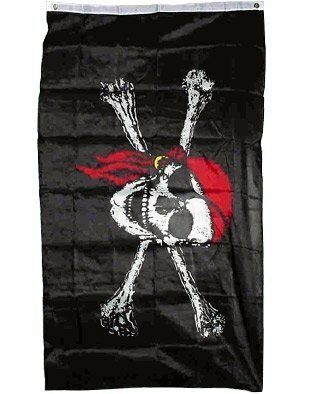 Bright red bandanna with gold ring and black eyepatch provide a striking contrast to a detailed Jolly Roger skull & crossbones pirate flag. Large size, for indoor or outdoor use.